Exotic oriental lilies and fresh tulips look just perfect together! This stunning bouquet is a great alternative to the classic red roses and is also bringing a sincere message of true love and appreciation! 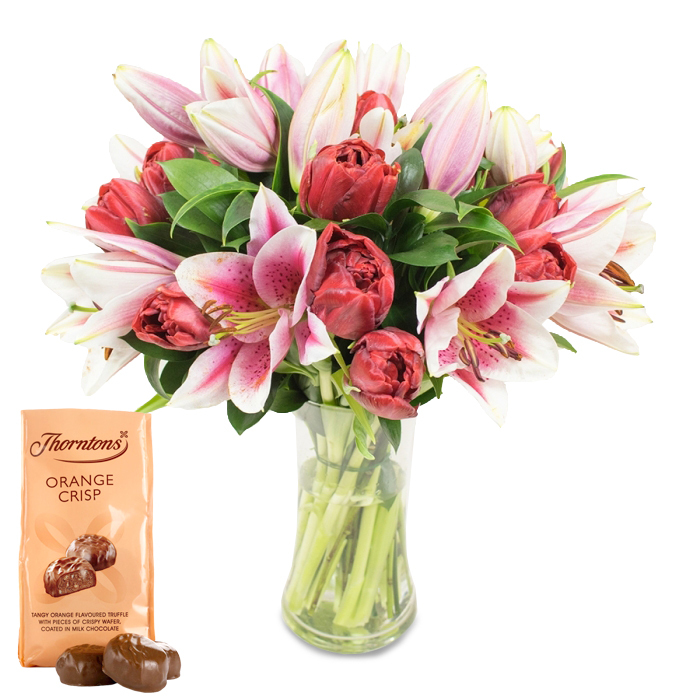 The perfect combination of flowers and chocolates will surely melt Mum's heart. Cool flowers, their brilliance really jazzed up the place. Since they're so nice, I think I'll be using them again, to send flowers to peeps for events and things. I'm extremely happy with the flowers!! The best online shopping experience I've had so far! Very nice combination - sweets and flowers. The delivery was made on time and my sister loved the surprise. Big Thank You! Amazing customer service. The team offered some wonderful bouquets at a price that I could easily afford. Very understanding and professional employees! Very fresh and colorful bouquet. It just made my day. Thanks for the prompt delivery! I just fell in love with this bouquet. Lilies are the most glamorous flowers and the florists had arranged them perfectly well. Very fresh and beautiful bouquet! My friend was really happy when she received it and told me that the flowers stayed fresh for over a week! Thank you for the perfect service!